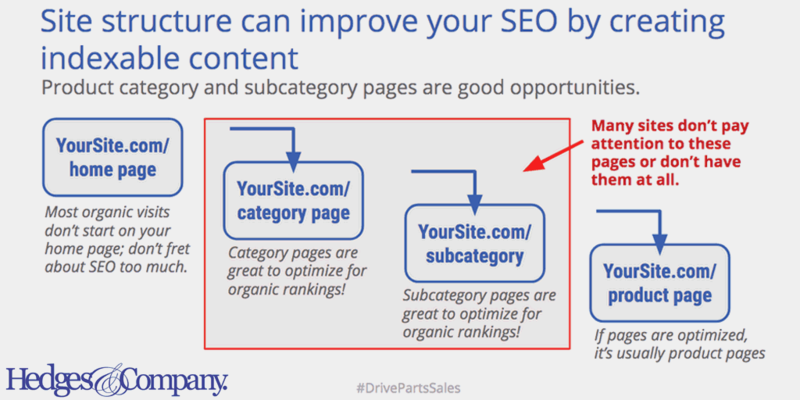 We put this auto parts SEO guide together because technical issues may prevent your auto parts site from ranked organically. For automotive SEO, content and inbound linking is critical but you also need a good technical foundation to build on for SEO success. Here is our guide to auto parts SEO covering technical issues such as site coding, site speed, page load speed, URL structure, category structure and mobile-friendliness. First, why is SEO important for your auto accessories or auto parts business? Before we get into the auto parts SEO guide, let’s look at search volume. Each month, there are more than 400 million searches on Google for auto parts or auto services. 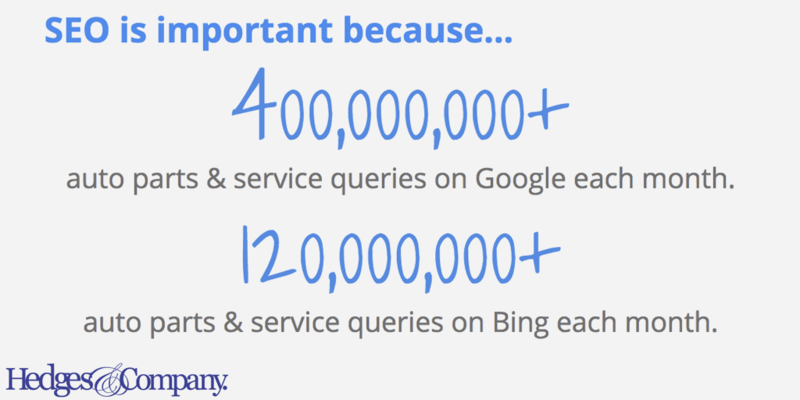 There are 120 million searches on Bing for auto parts and services, and about 80% of those Bing searches are unique to the Bing audience. Search engines are where consumers turn to first to find auto parts and services so if you don’t show up for these searches your company is pretty much invisible. Even manufacturers need to optimize for SEO today. Consumers are actively searching for manufacturer websites even if they’re going to buy an automotive part in a retail store or from an online retailer. Do you regularly check your auto parts website for 404 response code errors? These 404 errors cause more problems for your organic rankings than you may realize, which is why we wanted to start this SEO guide covering 404 errors. Those 404 errors are when someone clicks on a link to your website for a page that no longer exists. Auto parts SEO guide: Finding 404 'not found' errors are important for technical automotive SEO. Click To TweetThese missing pages create technical problems for your auto parts SEO efforts because while inbound links/backlinks are great to have, backlinks to non-existent pages are kind of a wasted effort. Here’s why: Inbound links are great and they pass “link equity” to your website and to the specific page they link to. When they link to a missing page and instead return a 404 “not found” error that link equity doesn’t get passed along. 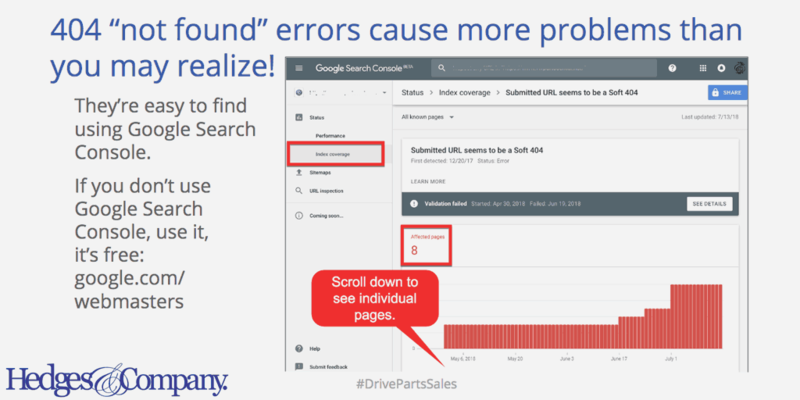 Also, these errors can make crawling your site more difficult for search bots, which in turn makes it harder for your auto parts site to index and rank for your targeted automotive SEO keywords. 404 errors can also have an impact on your off-page SEO by causing you to actually lose those valuable backlinks. And of course, 404 pages are just bad for user experience — your customers can’t buy your products if the pages don’t work! 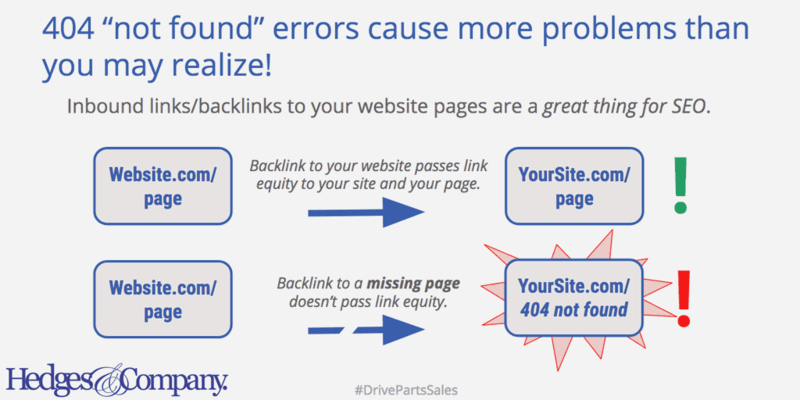 The next step of our auto parts SEO guide are locating all those 404 pages. The 404 errors are easy to find using Google Search Console. If you don’t use it, we recommend it. It’s a free tool from Google. Google Search Console will report all 404 “not found” pages that it finds and it’s a great resource to check with in a regular basis. 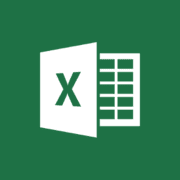 Bing Webmaster Tools has a similar report, too. By checking your auto parts site, you can identify 404 errors that are occurring and plan accordingly to fix them. It’s important to identify all missing pages with 404 errors and have a method to redirect these pages to working live pages. Whenever possible you should use 1:1 redirects — meaning that broken pages should be redirected to an updated live version of the page, or the closest counterpart possible. With some platforms, like WebShopManager or Magento, there are built-in functions to create redirects. WordPress has free plugins to create your page redirects that are simple to install. When 1:1 redirects are not possible, blanket redirects can be implemented — meaning redirecting pages directly to your site’s homepage. 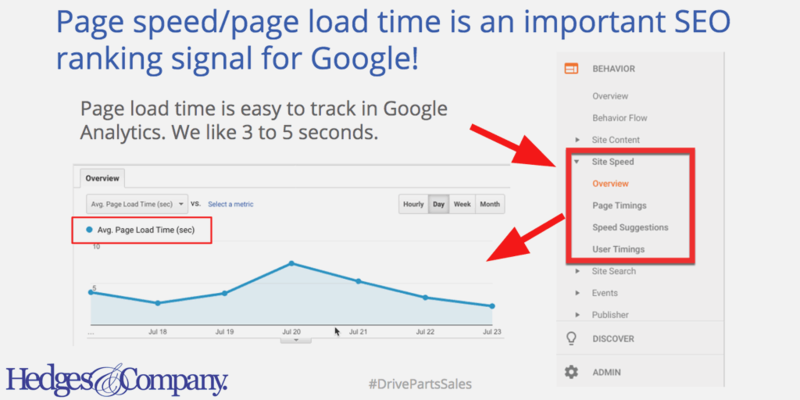 Next up in our auto parts SEO guide is an important topic: page load speed. It’s not only important for organic rankings but if you’ve ever waited a long time for a page to load you know how frustrating it can be for your customers. Although Google officially introduced speed as part of their ranking algorithms back in 2010 it has become very important in 2018, especially on mobile pages. Mobile page load time is now an official Google algorithm for mobile rankings as of July 2018. 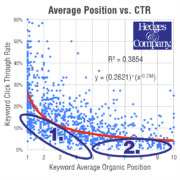 Page load time also affects user experience and shows up as a higher bounce rate and lower conversion rate, as shown in this graphic. We created this graphic from Google’s stats but there are plenty more stats where that came from. For example, 53% of mobile site visits leave a page that takes longer than three seconds to load. Page load time is relative, it is not a single point in time. In an effort to guide the process, Google says, “…it’s an experience that no one metric can fully capture.” Google measures page load time as a single standard to all pages, regardless of the technology that was used to build the website. Fortunately for your technical auto parts SEO project, tracking page load times for your website is easy. In Google Analytics go to Behavior > Site Speed > Overview and you’ll see something like the graphic here. 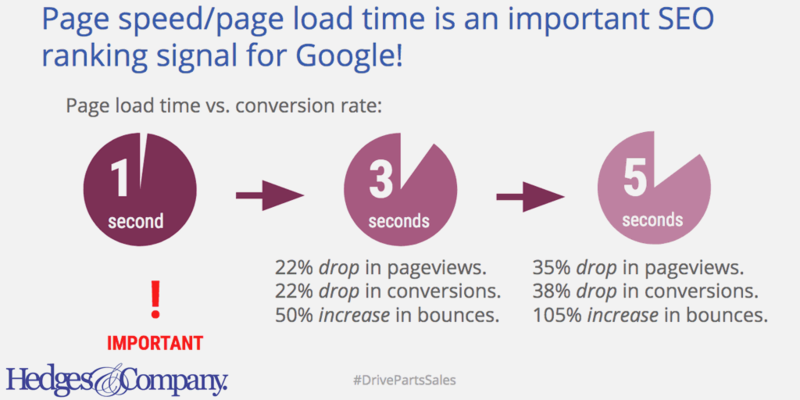 For auto parts websites we like to see an Average Page Load Time at 3 to 5 seconds or less. Certainly the faster, the better. It’s a good idea to watch your site speed and if there’s a spike, like in this graphic, track down the reason. Maybe there was a server problem on a particular day, for example. If your site speed is trending upward have a conversation with your auto parts SEO agency or your web developer. If there are any questions on how important page load time really is, just refer them back to this auto parts SEO guide for more information. This next part of our technical SEO guide is more involved and may require programming or web development help. Give some thought to your site’s structure because product category and subcategory pages are great ways to create additional indexable content for your website. We see too many auto parts websites where category pages and subcategory pages are not fully optimized from an automotive SEO standpoint. Don’t overlook these pages. Site structure and automotive SEO could be an entire blog post so we won’t go into great detail here, but as you consider your structure and your navigation, remember that as customers navigate through your site the URL structure needs to change based on category > subcategory or based on filters like year > make > model. Also make sure your URLs make sense to a human reader. A URL full of unintelligible code and text strings is not an optimal format for your auto parts SEO project. And finally make sure your rel=”canonical” tags are implemented correctly on your product pages and category pages. 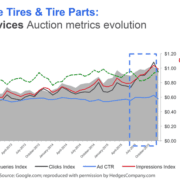 Here is the original presentation we did on technical SEO for auto parts websites. Did our technical auto parts SEO guide help? 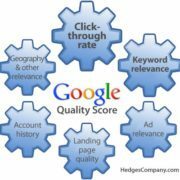 Hopefully you made it down the page this far, and hopefully this information has helped you in your project to rank higher in Google. If you have any questions on technical SEO feel free to reach out and contact us.